Everyone should have a room of one’s own, Virginia Woolf said. So back in 2014 we built an outdoor Dojo for my husband, James Langcake, to practice his Tai Chi in, and to store his large collection of practice weapons – swords, spears, staffs and guandao (an alarming spear with a curved blade on one end). I designed the hall and ordered the materials. James’ friend and Tai Chi expert, Nick Gudge, came over from Ireland and donated his time to mastermind the building of it. The thee of us (with a few volunteer helpers) worked our socks off for ten days and by then it had a roof, walls, windows and reclaimed patio doors from Freecycle. The earth floor was good for training on, which was just as well as we ran out of materials and time to lay a proper floor. Three years down the line, with the Open Studios looming, and the dust from the dry earth floor coating the walls, I decided to take matters into my own hands. James prefers to practice Tai Chi in the park (unless it is chucking down with rain or freezing cold) so the Dojo was a wasted space most of the time. I bought a reclaimed parquet floor and spent more hours that I care to think about cleaning it up. I paid someone to help lay the floor and build some storage seats. The space was starting to look amazing but there was still the hideous bathroom glass in the French windows. The original plan for the Dojo had included a stained glass dragon, but I knew I’d never get round to making it on my own. Jessica Stroud, a friend who is also a professional glass artist, wanted to learn some painting techniques from me and had come up with a design. Then I had a brainwave. We could try and complete the stained glass doors during the Open Studios. After all, if we could build a Dojo in ten days then two experts could surely knock up a stained glass window in two whole weeks. Well, there was a heat wave, and we had over 170 visitors to stop and talk to about the project, but we did it! 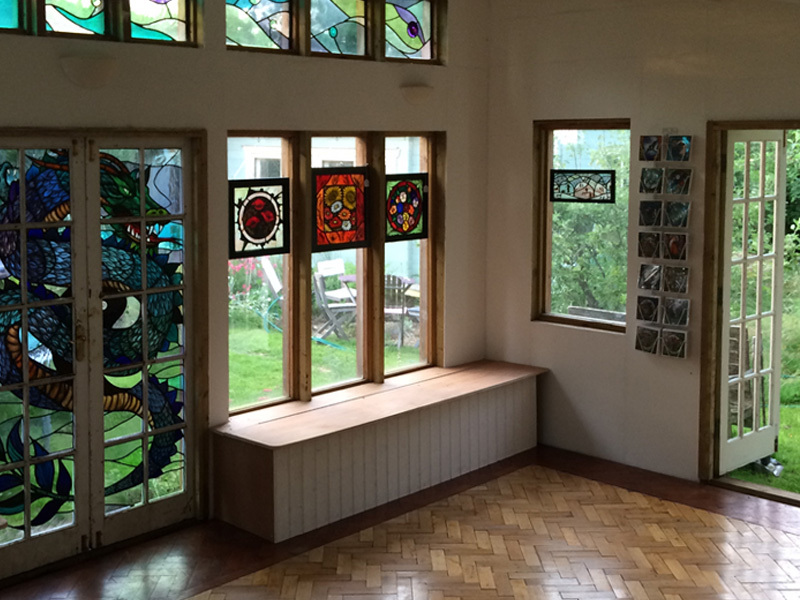 Clive Hoskin, another professional stained glass worker, gave up his time to fit the 20 panels on the hottest evening of the year. I even found a beautiful sofa on Gumtree that was being given away. The total cost of the Dojo (materials and labour) was under £10,000. Our thanks go to the many friends who contributed their time and skills to help create such a beautiful and versatile space. And there is still some decorating to do if anyone would like to get involved?